Popped a guy in the eye last night in sparring. He came back for more so I popped him again, same spot. First there was the tumbling roll. You know the one – crouch down, tuck your chin to your chest, and roll forward over your head. We all did it in grade school. If we were really cool, we’d do it from a standing position. Next there was the volleyball roll. I learned this one at summer volleyball camp. We hit the floor so many times that week, we totally lost our fear of it! Stretch your arm out to the side (because that ball can’t hit the floor! ), fearlessly launch yourself across the floor, hit it and flip your feet over backwards. You’ll end up on your feet facing the net, and look pretty awesome in the process! And then there’s a jujitsu roll. Ah, yes. That awesome roll where you reach your hand down across your body and hurl yourself over your shoulder. It’s neither a forward roll nor a sideways roll, but something in between. I had a bit of trouble when I was learning this one. Rolling forward over my head? No problem. Throwing myself to the hard floor and flipping over backwards? No problem. Gracefully rolling over my shoulder on a mat? Uh…problem. I spent so many years rolling forwards, backwards and sideways that the jujitsu roll confused my body! Or maybe it confused my brain. Anyway, I’ve managed to master the left side; it’s relaxed, fluid, and pretty darned good! But the right side? Not so fluid. I try. Believe me, I try, but it could never be described as fluid. Or graceful. Or anything else you’d like associated with a roll, really. I picture myself looking somewhat like a large, odd-shaped box that’s been shoved off the back of a speeding truck. Thunk. Thunk-thunk! Thuuud. Apparently I’m left-side dominant, which shouldn’t come as a surprise. Cartwheels (when I could)? Left side. Splits? Left foot forward. Hurdles and starts out of the starting blocks? Left sided! Last night I managed to stay on the mat when I rolled. It was a small victory! I’ve been known to roll off the mat or wander out of my own swim lane on occasion. Maybe I’m getting better? Hard to say! I’ll keep trying to improve my right side rolls, if only because I refuse to admit I can’t do them. (I might be just a little stubborn.) But for safety’s sake? I’m really hoping I never have to fall and roll to the right! Me: I’m sore from the kicks yesterday – my saddlebags. Renshi: You shouldn’t have saddlebags. Ha! I couldn’t even begin to argue with that! July & August – The brutal months! Whew! July has been brutal! I’m not talking about the 100+ degrees and lack of rain, either. I’m talking about calories. And August promises to be equally brutal! Our karate club has celebrated 3 birthdays in the last week. In August we’ll celebrate 3 birthdays within 5 days. Birthdays = Treats. Treats = Calories. Calories = Circuits? Maybe! Tonight we did circuits after doing a lot of basics up and down the floor and then kicks on the bags. Good thing, too, because we were celebrating two birthdays – mine and John’s. 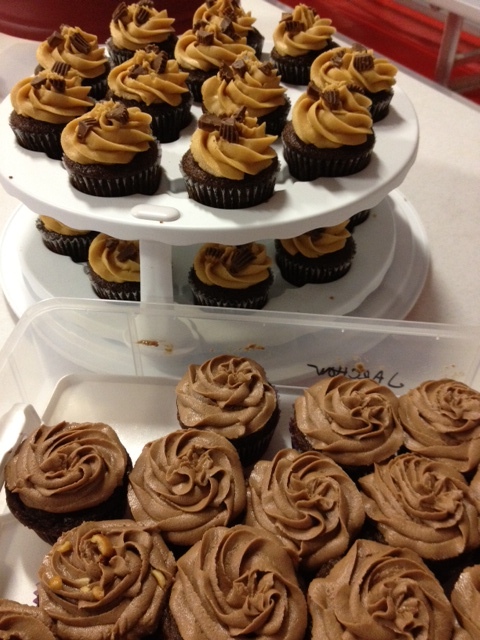 And because great minds think alike (not to mention the “bakers” didn’t coordinate treats), Susana and I both made variations of chocolate peanut butter cupcakes. And since there were two kinds of cupcakes, we had to try them both, right? Oh, don’t worry – we powered through, just like the disciplined martial artists we are. It was Chocolate Peanut Butter Overload, but we did it!! Our karate club isn’t going to stop celebrating birthdays, and I doubt anyone’s ever going to request hummus & veggies for their Banzai Birthday Treats. So my apologies to those who don’t care for circuits, but bring ’em on! For me, Circuits Before Treats = Less Guilt! Anyway, while I was watching the fights and elliptical-ing away, I realized the fights are the perfect thing to watch while you’re doing HIIT training. There’s a clock in the corner of the screen during each round of the fight! Once you determine your interval times, you just keep an eye on the clock and start and stop as planned. Pretty cool, right? 5:45 am – The alarms are going off already? Crap. What meetings do I have today? Do I have to be in at 8 or is 8:30 acceptable? 5:46 am – Wait – it’s Saturday; no meetings today. Good! But I am going to the hombu, and classes start at 8. 7:14 am – If this car in front of me doesn’t move it, I’m going to be late. Goody – now that I can pass, they decided to drive over the speed limit. 7:50 am – “Good Morning, Michele! !” Yippie. Sensei’s wide awake. This does not bode well for the workout. 8:03 am – A young Gumby is leading warm-ups. Hope we stretch! 8:12 am – Drills up and down the floor, and Miss Morning Person is not even awake yet. 8:36 am – What am I – crazy??? 9:09 am – How many more minutes in this class? I can hardly hold my arms up. 9:25 am – I’m done. 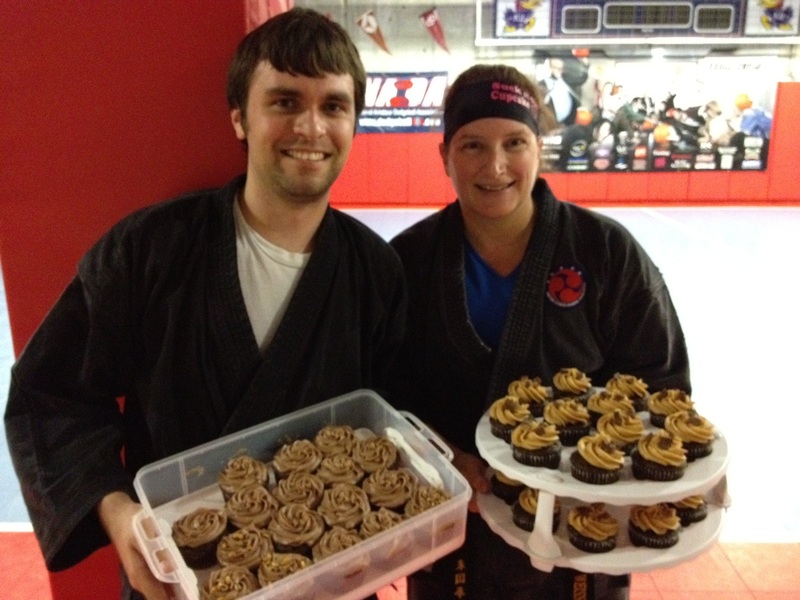 Brown/Black Belt class is almost over. 9:58 am – Watching jujitsu and wishing I was doing the class too. Paying attention and learning a couple things from my seat in the Peanut Gallery. 10:30 am – Family open class. This time Miss Morning Person’s leading warm-ups; we stretch. 10:35 am – 50 more crunches, 40 more push-ups. 10:50 am – More kata. Kata is deceptive – looks not-so-bad, but is quite the cardio event. 11:15 am – Self defense with Lauren and laughing because she has the funniest hiccups I’ve ever heard! 11:30 am—Gearing up for sparring. I have lots of padding because I have lots of me, so it takes awhile. 12:00 – Ruben beats me up. What is he – 7? 9? He’s a little gizmo – full of pep. 12:16 pm – Sparring class over. I survived intact. 1:15 pm – Lunch with friends. Conversation about karate and life.